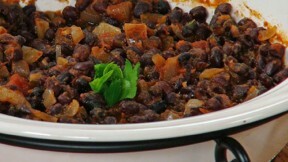 This tasty and economical bean dish just may be the easiest casserole you’ll ever make! As a side dish, it stands in perfectly for traditional baked beans, but it can shine on its own too, as a one pot weeknight meal to serve anytime of the year. The best part is that there are only five ingredients in this delicious recipe, so you can whip it up in a flash! Place all the ingredients in a medium bowl and stir to combine. Pour into a medium casserole dish. Cover and bake for 1 hour, stirring occasionally.